Who was Leo F. Cain? Leo F. Cain was the founding president of California State University, Dominguez Hills, serving as its leader from 1962-1976. Cain led the launch of the university, beginning with its temporary home in the California Federal Bank building in Palos Verdes and was at the helm of the design and construction of the permanent Dominguez Hills campus. With the help of architect A. Quincy Jones, Cain's vision of a unified campus design was realized. Members of the Leo F. Cain Legacy Society are a distinguished and thoughtful group of benefactors who have made a commitment to the future of California State University, Dominguez Hills. 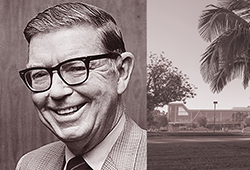 The Leo F. Cain Legacy Society is dedicated to recognizing individuals during their lifetime who have chosen to support California State University, Dominguez Hills by including the university in their estate plan. Leo F. Cain constructed a solid foundation for the university to build upon, ensuring that it was in a position to serve the needs of students and the community in the decades to come. By including the university in their estate plan, members of the Leo F. Cain Legacy Society are following his lead. Members of the Leo F. Cain Legacy Society receive a number of special benefits in honor of their commitment, generosity and foresight, including year-round invitations to special events and/or hosted receptions. Members are also recognized in the fall edition of Dominguez Today magazine.